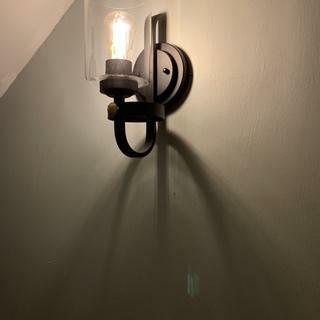 This beautiful bronze wall sconce comes with an Edison-style LED bulb that provides greater energy-efficiency as well as a lovely vintage look. Update your home with the transitional style of the Eagleton single light wall sconce. The handsome design comes in oil-rubbed bronze finish, featuring gold finish accents for added style. A glass cylinder protects the vintage Edison style LED bulb while allowing a clear view to the decorative style bulb. 12" high x 5 1/2" wide. Extends 7 1/2" from the wall. Backplate is 5 1/2" high. Glass shade is 6 1/4" high x 4 3/4" wide. Weighs 2.24 lbs. Includes one 7 watt amber Edison style LED bulb. 800 lumens, comparable to a 60 watt incandescent. 2200K color temperature. 80 CRI. 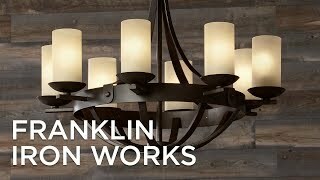 Eagleton rustic farmhouse single-light dimmable wall sconce from the Franklin Iron Works brand. Oil-rubbed bronze finish with gold accents. Clear glass shade. Fixture takes maximum 60 watt standard base bulbs. Can be installed with glass shade pointing up or down. Ordered 2 prior to this for a remodel. THE SIZE , LOOKS A LITTLE ELEGANT WITHOUT LOOKING TO RUSTIC , THOUGHT IT WOULD LOOK NICE NEXT TO A BARN DOOR GOING FROM A BEDROOM INTO A BATH. To put up on a brick wall. It has a unique look that is similar to our dining room light. The light also has an interesting bulb and glass protection. Excited to see how it looks! Is there a version on this light without the gold dot in the front? Can it be hung outdoors? Is it outdoor rated? BEST ANSWER: Hi - No, this lamp is not rated nor designed to be used outdoors. I believe this is an indoor only lamp. Note the glass opening is pointing up and would collect leaves, rain and snow and etc. Does this provide good lighting for a playroom or it is more decorative lighting? Looking for l2 sconces to light up our 12x15 playroom. Can this be hung upside down as well? BEST ANSWER: Hi - Yes, this can be installed with the glass shade pointing up or down. Is the material iron? Or a coated metal like stainless steel? BEST ANSWER: Hi Danielle - This is made of metal painted with an oil-rubbed bronze finish with gold accents. Does this sconce have an on off switch on the unit? BEST ANSWER: No - This is a hardwired design that requires electrical installation which is controlled by a wall switch. No, this the lamp does not have an on off switch. It is wired through a wall switch. I needed three lights for my hallway these are absolutely beautiful I am so happy I ordered them. The glass is so pretty the sconce it’s self is stunning and the lightbulb is great too. I will be ordering from them again soon as I need to redo a bathroom. Couldn’t be more pleased with my purchase they came quickly they were not expensive. Lamps plus is the best. One of three I purchased ?? I ordered this sconce to see if it was what I wanted and see the quality. Ot was just what I wanted. Quality wise there was an issue with the socket; it was crooked and the bulb pointed NorthEast. I was afraid to bend it because it was on a weld. So, I called Lamps Plus and they immediately provided me with a FedEx label for a free return and it 's in the process of being replaced. I ordered three more. I would recommend the sconce. 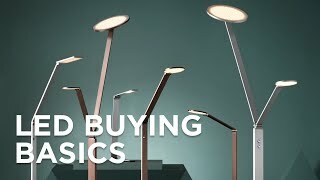 We would recommed “lamps plus “ for your lighting needs. Light is well made and we liked the design. With a 60 watt LED bulb, ample light is given off. Have not installed it yet, but it is gorgeous. We got these for hallway to replace 4 old sconces. We love that they look good from the side and when looking directly at them. Also the light is allowed to dim which we absolutely love!